Following nuclear waste shipments down the freeway. Tommy Cash, driver of a TRUPACT shipment, at a rest stop on Interstate 25, Colorado. Under the cloak of an intellectual aim, the materials have been completely murdered and can no longer speak to us. If one leaves the material as it is, presenting it just as material, then it starts to tell us something and speaks with a mighty voice. What you do not see is the material itself: the vast quantities of spent nuclear fuel, uranium mine tailings, radioactive medical waste, and contaminated soil, debris, clothing, tools and equipment transported routinely along American streets, highways and railroads. As it crosses jurisdictional lines, this material bends political, economic and environmental realities around itself. It reshapes geologies and reconfigures landscapes now and into deep futures. And it does so almost entirely without notice. For 12 days last fall, we traveled routes taken by transuranic waste headed for burial at the Waste Isolation Pilot Plant, near Carlsbad, New Mexico, to see what it would take for two humans to acknowledge, and briefly move with, this most abject material. Seventy years into the Atomic Age, designers, engineers, governments and the public have not been able to adequately imagine or build infrastructures for the long-term containment of materials that are too dynamic to be named, or understood, merely as “waste.” The United States is currently processing, shuffling and storing nuclear byproducts at some 20,000 sites throughout the country. About 70,000 metric tons of spent reactor fuel are held at power production sites in 33 states, an amount that increases annually by 2,000 metric tons. Another 13,000 tons of high-level nuclear waste is left over from weapons production and other military activities. You could say that high-level waste is “sheltering in place,” waiting for the first infrastructure — perhaps a deep geological repository like the cancelled Yucca Mountain project — capable of containing it for the span of time mandated by the Environmental Protection Agency: one million years. No such storage options are expected to be available for at least the next century. Less potent than high-level nuclear waste, but with a long half-life, transuranic waste is considered dangerous for 24,000 years. Since the 1940s, the U.S. has accumulated one million cubic meters of transuranic waste, mostly materials contaminated during weapons production. After being retrieved from legacy pits, trenches or temporary storage, and then processed, these wastes are queued up for shipment to WIPP, where they will be buried in a 250-million-year-old salt dome. This deep geological repository is expected to reach capacity around 2030. SlideshowLeft: Interstate 80, Utah. Right: Clive Facility, Utah, the nation’s largest private low-level radioactive waste disposal site. SlideshowLeft: Passing a CNS 10-160B shipping container carrying transuranic waste, Interstate 80, Utah. Right: Clive Facility. SlideshowLeft: Crescent Junction, disposal cell for uranium tailings, Interstate 70, Utah. Right: UMTRA Project, uranium mill site under remediation, Moab, Utah. SlideshowLeft: Highway 163, Utah. Right: Mexican Hat. SlideshowLeft and right: Mexican Hat, Utah, disposal cell for uranium waste, on Navajo Nation land. SlideshowShrink-wrapped reactor components, Clive Facility. SlideshowUMTRA Project, Moab site, with Arches National Monument in the background. SlideshowDrinking green tea at the Mexican Hat disposal cell. SlideshowTRANSCOM Communications Center, U.S. Department of Energy, tracking shipments to the Waste Isolation Pilot Plant, near Carlsbad, New Mexico. SlideshowHighway 285, New Mexico. Right: Truck stop, Vaughn, New Mexico. SlideshowLeft: KFC in Shiprock, New Mexico. Right: Blue sky at Shiprock disposal cell for uranium waste, on Navajo Nation land. SlideshowLeft: Gas station outside Los Alamos, New Mexico. Right: Bradbury Science Museum, Los Alamos National Laboratory. SlideshowLeft: Interstate 25 southbound, Colorado. Right: Passing TRUPACT shipping containers, Interstate 25 northbound, Colorado. SlideshowLeft: TRUPACT shipping containers, Interstate 25, Colorado. Right: TRUPACT shipment at rest stop. SlideshowLeft: Knolls Atomic Power Laboratory, Niskayuna, New York. Right: Rocky Flats Wildlife Refuge, former nuclear weapons production facility, near Denver, Colorado. SlideshowLeft: Candelas™ commercial and residential development, Arvada, Colorado, adjacent to Rocky Flats Wildlife Refuge. Right: Edison Woods subdivision, Niskayuna, New York, adjacent to Knolls Atomic Power Laboratory. The nation’s four main routes for transporting transuranic waste — from sites as far apart as Washington, New York, California and South Carolina — converge on Highway 285 in southern New Mexico. We began our field research in Utah, visiting infrastructures and engineered landscapes that facilitate the movements of nuclear waste along interstate highways, including production sites as well as low-level waste storage facilities, uranium tailing piles, and earth and riprap mounds for shallow burial of contaminated tools and objects. We met humans who regularly move with nuclear materials, and interviewed a truck driver, a shipment tracker at the TRANSCOM office, and citizen monitors at the Rocky Flats Site near Denver. We encountered four waste shipment trucks and shared the road with them for short stretches. All told, we shot 20 hours of video on a car-mounted, wide-angle HD video camera, as well as 800 photographs and four rolls of Super 8 film. The resulting exhibition, Look Only at the Movement, includes a three-hour, two-channel video, as well as photographs, graphic design, map, and written audience responses. Looking only at the movement of nuclear waste, we have tried to avoid the polarized discourses that often “cloak” nuclear materials, hoping to encourage new angles of civic exchange. We invite audiences to engage with contemporary material realities that are simultaneously of us, and far beyond us. Map and site key, Look Only at the Movement, 2013. 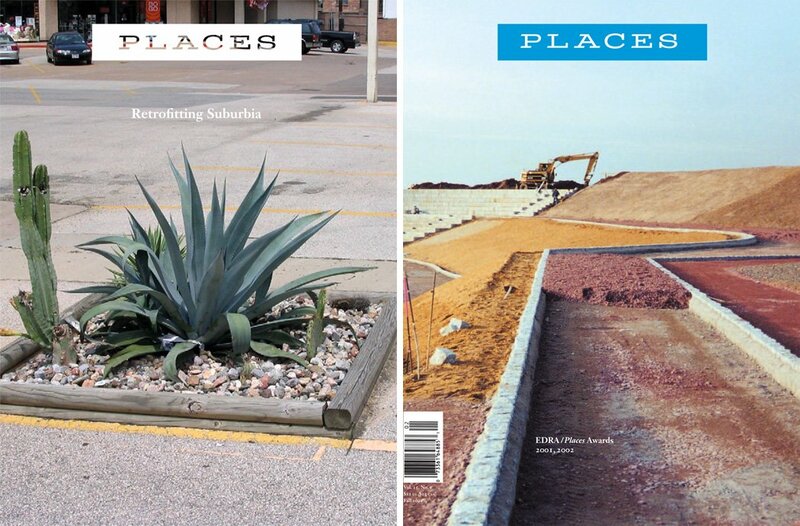 For related work on Places, see Infrastuctural Tourism, by Shannon Mattern, which discusses the project Repository: A Typological Guide to America’s Ephemeral Nuclear Infrastructures, also by Jamie Kruse and Elizabeth Ellsworth (smudge studio). Look Only at the Movement premiered October 3, 2013, at the Sheila C. Johnson Design Center, Parsons the New School for Design, in New York City. In 2014–15, the exhibition will travel to the Santa Fe Institute of Art (Santa Fe, New Mexico), Center for Land Use Interpretation (Wendover, Utah), Rocky Flats Cold War Museum (Arvada, Colorado), and Center for Art + Environment, Nevada Museum of Art (Reno, Nevada). Field research for Repository and Look Only at the Movement was funded by the Graham Foundation for Advanced Studies in the Fine Arts. In the middle of Missouri, you will find the one building outside of England connected to England’s greatest architect, Christopher Wren. What the devil is it doing here? I find this an intriguing but somewhat frustrating piece. Certainly nuclear waste is an important and often neglected issue, but paying attention only to its materiality kind of misses the point. It is the invisible radiation that makes nuclear waste not only deadly but ontologically terrifying. Kind of like the picture at the truck stop where the barrel-shaped nuclear waste containers are obscured by a tree, one wonders why the authors are deliberately avoiding looking at their subject. Perhaps, as they say, in order to avoid the "polarized" discourse, but here they do not even present the issues under debate: whether this material should ever have been created, who bears the responsibility for those past decisions, who shoulders the risks the material poses today, and how answers to those questions influence choices over what to do with it in the future. As president of ADPSR (Architects / Designers / Planners for Social Responsibility), I too have inherited a connection to the issue -- ADPSR was founded in opposition to nuclear weapons. The risks of nuclear waste are part of the same Cold War nightmare as nuclear winter. On this side of the "polarized" debate the position dating back to the 1980s was to stop making more nuclear waste and find appropriate and renewable sources of energy. With current evidence bearing out our position -- nuclear plants unbuildable without massive subsidies, two plants closed this past year for safety concerns, wind now the cheapest new energy source to install, solar prices falling even faster -- a clear-eyed look at the nuclear waste legacy is a good idea. While the snapshots of places around the physical locations of waste handling convey some charge, I'd propose that the changing political and economic landscapes that drive this system can not simply be ignored. Jamie Kruse is an artist, designer and part-time lecturer at Parsons, The New School for Design, and co-founder of smudge studio. Elizabeth Ellsworth is an artist and Professor of Media Studies at the The New School and co-founder of smudge studio.